From vintage surfboards made 50 years ago by master board builders in the 1960s to today’s modern surfboards, John chooses to begin with only the most eye pleasing hull designs. His process includes bringing the body back to original structural condition and then redesigning the interior of the board, its foam core, by cutting and hand carving that portion into a new mosaic or form. The process then moves to application of coatings, color and artistic finishes, accent inlays of gold leafing, papers, mirrors, fabrics, stonework, tile, exotic woods or glass. 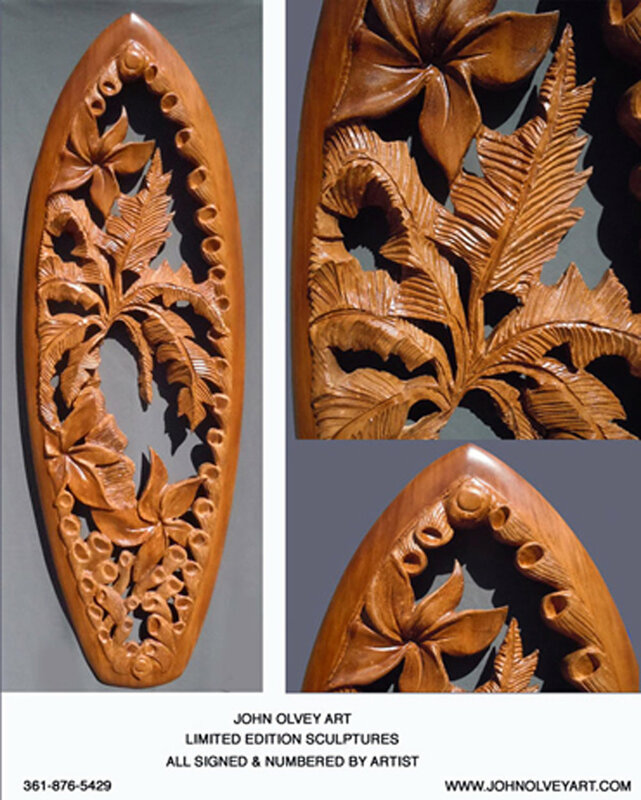 John uses as many different material techniques and tools as needed to create his vision for each. Commissions are welcomed. Highest quality materials used with a variety of finishes available to suit your specific decor requirements. The use of surfboards as canvas and sculpture media is the modern tribute to cultures from centuries ago. Ancient Polynesians practiced this royal custom of reserving the King’s relationship to God and the life force that is the ocean to a King’s sovereign ability to stand up and ride the waves. Today, the surfboard has seen a resurgence of popularity. First, the board as a tool, much like an artist’s brush that is selected and used to create calligraphy of dance on the moving, liquid canvas. Second, the vintage board has become treasured by collectors who stay connected to the coastal lifestyle. Ancient building methods consistent with historical practices, including important rituals and offerings that was an integral part of board building. The right tree had first to be found, a process involving kahunas who would search for the correct wood, invoking the spirits for success in their task. Ceremonies were then conducted (even with relation to cutting the selected tree down) and then much subsequent ceremony would attend the actual shaping and finishing of the wood into the desired board by master craftsmen and artisans who specialized in wood products. The final ho'okupu offering is made to recognize the new life of the wood, assuring the gods that the original life of the wood is continuing in this new form.